This 3-4 season bag has extra filling so it’s warm enough to see you through an entire year of family camping and touring. Oﬀering outstanding comfort levels usually experienced in high quality duvets for home use, the Outwell Constellation range of sleeping bags excels in delivering superb quality, inspired features, outstanding fabrics and premium ﬁlling without compromise. With a durable, ultrasoft, brushed outer, 100 percent cotton lining and premium Isoﬁll ﬁlling, Constellation Lux and Constellation Lux Double – oﬀer ample room for supreme camping comfort. 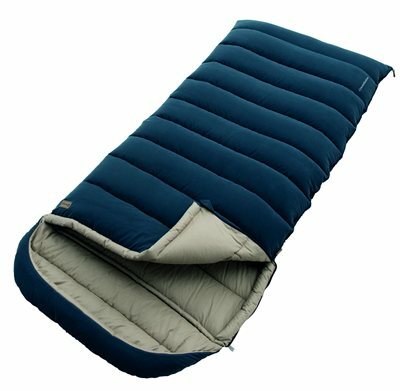 An insulated soft cotton lining baﬄe runs across the opening of the sleeping bag improving next-to-skin comfort and keeping neck and shoulders warm on chilly nights.The generous-sized hood can be removed easily when a bag is used as a duvet or two singles are zipped together to make a double. 3. Hood pillows zip off and allow for two bags to be zipped together as one. My only complaint here is had there been a second zipper on the top side for the hood, the pillows could both be reattached when it’s in the double form. 4. Two way zippers allow for many venting options. 5. Color combo was appealing and will go with many camp blankets. We have not yet used these in extreme cold weather but I am happy with the quality and value. The stuff bags could be better designed to make the whole deal smaller and I don’t think those zippers willlast but...Cei la vie! Love this sleeping bag, it's lovely and warm and looks so snuggly you want to climb in immeadiately. Only downside is it doesn't pack down small but we use them in the car for the kids to lean/sleep on. nice, spacious and warm but a bit heavy and big when packed.